So what did I read this year? Mosquito by Roma Tearne – loved this. I have 3 more books by Tearne which I’m looking forward to reading. The Road from Elephant Pass by Nihal de Silva – my favourite book of the challenge. Cinnamon Gardens by Shyam Selvadurai – a re-read which again impressed upon me what a fine writer Selvadurai is. I’m eagerly awaiting his next book. Serendipity by Ashok Ferrey – this novel didn’t really work for me however I’m a huge fan of his short stories so looking forward to reading more by Ferrey. The Moon in the Water by Ameena Hussein – dark and melancholic and definitely looking forward to reading more by Hussein. Interpreter of Maladies by Jhumpa Lahiri – my introduction to Lahiri. I love her easy style. Which makes 6 books in total, most concentrating on Sri Lanka. Can’t be helped as I like discovering my roots! This is a great challenge in which to participate if you have an interest in South Asia and its literature. Swapna’s built up a wonderful directory of literature by South Asian authors and set in South Asia, so do check her blog. And the sign-up for the 2011 challenge has already begun. So, are you going to join us this year? 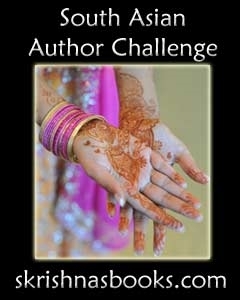 Here’s to exploring more South Asian authors and literature in 2011! I am joining this challenge in 2011 (the first time I’ve done a challenge!). I think I can find books in this field easily. I didn’t finish this challenge. I feel so badly. I had good books picked out too. Love the book chosen by you.Congratulations for finishing the challenge. Eva: I thought Mosquito was beautiful too. Selvadurai’s writing a book based on the Buddhist Jataka tales (which I know very little about) so I’m really looking forward to that! lemon123: There’s always next year:) However I feel part of the fun is picking out the books you want to read, so you shouldn’t feel bad at all! the lit festival in srilanka is coming up soon, isn’t it? and it’s snowing on this blog again – it’s nice to feel a year pass when you grow your interest on something. literature gives you so much insight into a culture , that i am eager to read novels before and after my travels. i probably wouldn’t have read srilankan lit to this extent if i hadn’t visited the country and wasn’t charmed by it. I’ll be going again to the Galle Lit Festival so am compiling a list of books to read:) I also love reading about whichever country I’m travelling too. It makes the travelling experience more immersive. THANK YOU SO MUCH! will look for them.